Another football week is behind us, full of upsets, great goals and fantastic individual displays. EA chose the Team of the Week 20. Among players who found their place in Team of the Week 20 are Benzema, Di Maria, Semedo, and others that will be highlighted in today’s article. Nice played an amazing match against Nímez Olympique and beat them 2-0. Benítez played one of the crucial roles in this victory. He managed to stop seven shots from Nímez’s players. He helped his team to win and keep a clean sheet. If you won a standard Benítez card, then you probably are not satisfied with him. The difference between his standard and in-form card is pretty huge. 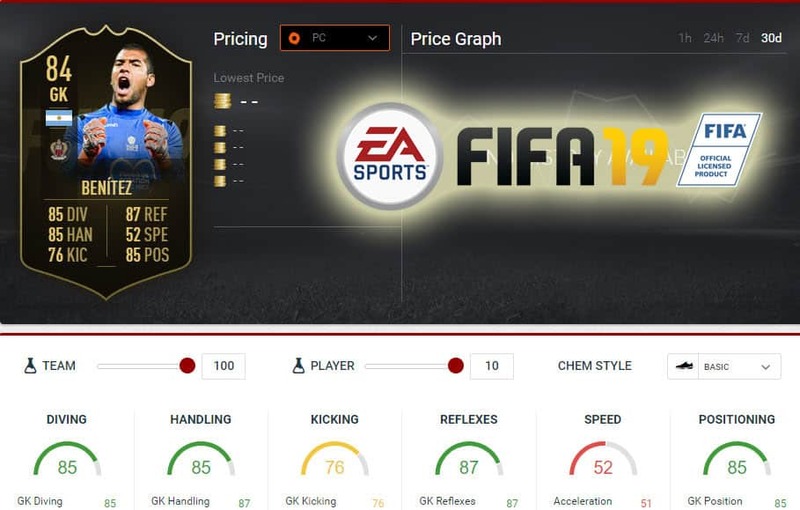 His standard card is rated 76, while his new in-form card has a rating of 84. As you see, Benítez was already in Team of the Week, and you should definitely consider buying his new card for your Ligue 1 squad. Montpellier also beat their team 2-0. Caen had a tough time trying to pierce through Montpellier’s defense. One of the most deserving players for that was Montpellier’s captain, Hilton. He had a very good statistic. Montpellier’s center-back had 13 clearances, one interception, and stole one ball. Caen’s attackers didn’t manage to pass by Hilton a single time. He was stronger than the wall. He is almost the same in FIFA 19. Hilton has amazing defensive abilities and very decent passing and ball control stats. He would be a great teammate with Benítez. Someone would say that Atletico Madrid’s center-backs have one of the hardest jobs in the world. We would definitely agree with that presumption, because of the very defensive style of football that Atletico Madrid uses. So, we could say that Gímenez did a very good job stopping Getafe’s players to score. 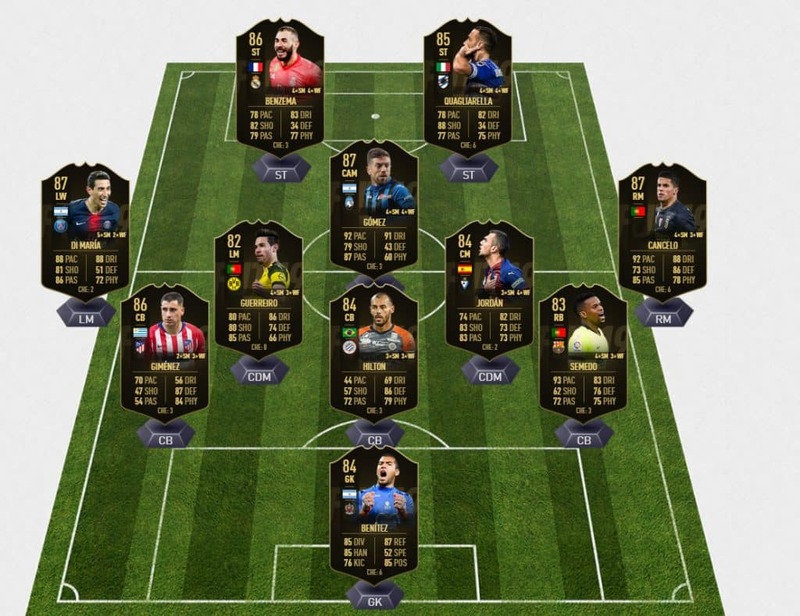 It’s very odd that Gímenez didn’t find a place in TOTW before, but it seems like he totally deserves to be part of Team of the Week 20. If you are looking for good center-back for your La Liga squad, don’t look further, here is the perfect player for you. If you don’t have enough money to afford his in-form card, then you should be okay with buying his standard card which costs 6,000 coins. That’s a small price for such a good player. Barca won against Girona with ending result 2-0. So, part of the reason for Semedo being in Team of the Week 20 is a clean sheet. But, that’s not all. He also helped his team by scoring one goal. Truly, the job of defenders is to prevent opponent’s players from scoring a goal, but it doesn’t mean that they shouldn’t score one by themselves from time to time. If you seek fast and aggressive right-back, you should take Semedo into consideration. His FIFA 19 stats reminds us of right-winger instead of right-back. Nevertheless, he knows how to tackle as well. You could buy him for 5,900, and his in-form card is surely going to be much more expensive. So, if you want him in your team, start saving money. This is not Jordán’s first time to be part of TOTW. He already knows how it looks like to be picked for the best team of the week. Unlike previous players’ teams, Eibar didn’t manage to win the game but didn’t lose either. They drew versus Leganés, and Jordán scored once and provided one assist. If you are looking for the reliable CM who also knows how to pass the ball, search for Jordán in Transfer Market. Guerreiro is a phenomenal player who can play in a couple of positions. We included him in our Bundesliga 50k squad as left-back, and in Team of the Week 20, he is left-wing. He was very aggressive in Dortmund’s triumph against Hannover. Guerreiro scored one goal and provided his teammates with one assist. Also, he had numerous key passes. If you are interested in his qualities, you can check our article about Bundesliga 50k squad. A Team of the Week 20 is the third TOTW for Cancelo this season. That shows us how good season he has. This time, he needed only 20 minutes to score a goal in Juventus victory over Lazio. Cancelo has just incredible stats, but he is also very expensive. You’ll need more than 200k coins to buy this card. Gómez was one of the main reasons for Roma’s blunder against Atalanta. The team from the capital of Italy managed “only” to draw the game with Atalanta. Gómez gave his best to make a job for Roma harder. He scored two goals and was a constant threat for Roma’s defenders with seven key passes. His in-form card in FIFA 19 is just unbelievable. His passing, dribbling skills and pace are incredible. If you need that kind of player for your Seria A squad, consider buying Gómez. One of the best left-wingers in the world performed pretty well against Stade Rennais. He contributed to PSG’s victory over Rennais with one goal and one assist. Also, he was a constant danger for Rennais’ defenders who needed to look at Di María’s passes very carefully. Di María created several great chances alongside his assist and proved that he deserves a place in Team of the Week 20. Of course, Di María would be perfect for your Ligue 1 squad, but you would need so much money to buy him. Sampdoria beat Udinese 4-0, and Quagliarella scored half of those goals. Plus, he assisted his teammates once. He is a classic, old-school Italian striker who knows how to score. So, if you have problems with strikers who have a problem with finishing, try this player; it will be really refreshing for you. The fact that Team of the Week 20 is the first TOTW that includes Benzema tells us a lot about his form this season. He struggled a lot during this year, and finally managed to score a couple of goals. He helped CL champion to beat Espanyol 4-2 with two goals. Therefore, he was named MOTM. Karia m is great striker in FIFA 19, but if you want to use him, you need to be patient because Benzema has all attacking qualities, but is also relatively slow and robust.